The Player is right there in the midfield. Being one of AKRacing‘s entry level chairs the Player Series is priced at around 230 quid and offers all the usual merits this brand brings to the table. My intention with this review was to give you guys an idea of how AK’s more affordable gaming chairs perform. I could have gone with either the Rush, Prime, Octane or Nitro Series since they are very similar but since my time and budget is limited I more or less randomly picked the Player. Furthermore, the Player Series design is also very popular among customers, so I think that overall it is a good example for examining the qualities of the company’s essential product line. With all that clarified, let us get right into my Player review! For those of you that got bored of the usual black colour, I tend to prefer I went for a flashy red this time. To my surprise, the most popular style among you guys is the green/black one followed by the white/black version. My video of the Player Series review features the assembly as well as a demonstration of all the functions so you can get a pretty good idea of what this chair is capable of – even though I have not done an Englisch voiceover yet. 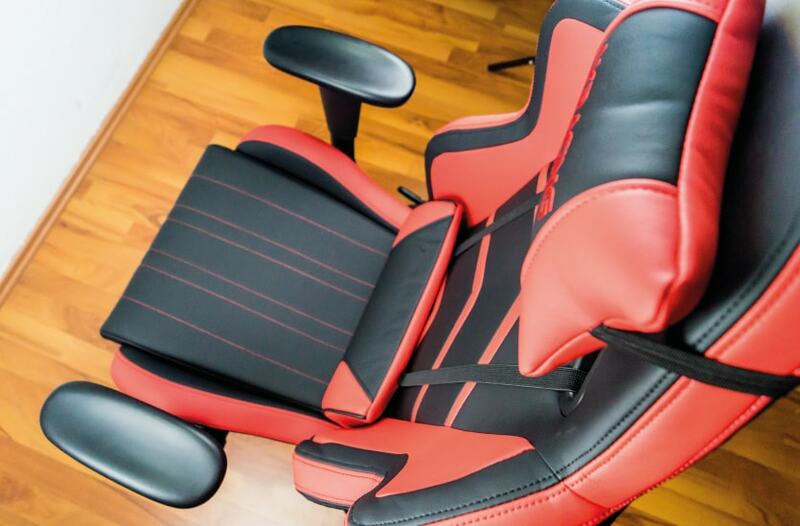 The shape of the Player Series is as unexciting as it is awesome … ok, that sounded strange – let me be more precise: You may call it unexciting because it looks like almost any other mainstream gaming chair and it is definitely awesome because it is exactly the design everybody is looking for! The same goes for ergonomics: It is a chair that fits the average Joe. The side support is not too crampy, but it gives you a nice race car feeling while all the adjustable components – armrests, seat height, pillows – are geared to the majority of gamers. In matters of design, there are stitchings on the seating surface and the arrowhead-like stripes on the backrest that make the Player Series somewhat unique. The rest of its exterior is pretty much AKRacing standard aka black aluminium base, black PU armrests, logos on both pillows as well as on the headrest and fancy rims inspired casters. The upholstery’s density is 55 kilos per m³ for the seat and 50 for the backrest which sounds promising regarding durability. In comparison to more expensive chairs like the ProX, the King Series of DXRacer or the EPIC however, the cold foam stuffing is on the thinner side – not uncomfortable, but noticeably thinner. Yeah, it is a synthetic leather covering, and no there is nothing special about it. With its decent alignment, elegant looks and pleasant feel it is on par with all the other basic chairs from DX, AK or Vertagear. It is out of the question that it can not keep pace with noblechairs‘ manufacturing quality but for what is and costs there is nothing to complain about. It is not always good trying to be different just to stand out from the crowd, but in the case of the castors design, I do like what AKRacing has done. Instead of just making them plain solid wheels like almost all the other manufacturers do they made them look like rims of a fancy sports car. You can find that style on the Nitro, Arctica and Octane as well as on the reviewed Player Series of course. In practice, they roll silently and should not put too much stress on your flooring – although I would still advise you to use a protective mat or upgrade your Player with AK’s Rollerblade Rolls. The armrests are a curved to prevent your elbows from slipping down the sides, and their cushioning is a bit softer than usual which improves the comfort. What makes AK’s seats unique is that most of them recline to an incredible 180-degree angle which means you can adjust the backrest down all the way until it beeing parallel to the ground. Although the practical use of this feature is somewhat questionable it for sure is nice to have. Furthermore, you can lock the tilt function almost stepplessly on the way up or down. The lower lever lets you switch the also lockable rocking function on and off. In addition to that, the same lever drives the gas lift up and down within a 9 cm range – starting at 43cm all the way up to a sitting height of 51cm. To support your lumbar and neck area appropriately, the reviewed Player Series draws on faux leather covered pillows – pretty standard, but they fulfil their purpose. I think replacing the PU with a nice sort of fabric like noblechairs did would be awesome but as of today, the EPIC Series‘ velvet cushions are still one of a kind. Maybe even bring memory foam into the game … but that is pie in the sky. Sitting in the Player Series for extended hours – which usually means 10+ for me – is no problem at all. Of course, PU-leather has its limitations regarding breathability, and I would prefer softer cushions, but that is a general “problem” not a concern with the reviewed Player. My only critique is that the padding could be a little thicker, other than that, it satisfies my expectations. On one condition of course: You have to fit into the Player’s dimensions to profit from its ergonomics and not feel cramped. Make sure to check out my Size Guide down below. Since base, frame and gas lift are ruggedized to carry up to 150 kilos I was not concerned about anything breaking throughout my testing period – and I was right. No visible wear except for some scratches and maybe a few more wrinkles in the seat’s covering. I would rate this as “being up to scratch” which is a splendid outcome. The Player Series is available in many colourful designs – there is even a pink version of this chair in stores. You are wondering which colour is the most famous? Well, as far as the German market goes it surprisingly is the green/black model. Green, in general, has become the colour of choice for many gamers ever since Razer decided to make it their primary distinguishing characteristic. So, maybe that is the reason people are of all things going for this Player. If you want to pimp out your Player a bit, you can always draw on the extra large gas lift or AK’s remarkable Rollerblade casters – check them out here: → Accessories on Overclockers. Height-wise I put the sweet spot at around 1.80m, and in matters of weight I think give or take 80 kilos is perfect – add some manoeuvring room of roughly 10 percent to it and you are ready to go. One might wonder why I use the term “unexciting” to describe AKRacing‘s Player Series – let me explain: This seat just does not do anything special but it is equiped with almost everything a quality gaming chair is supposed to offer. From its adjustability over the quality-level up to design aspects the Player is a crowd pleasing racing seat with an excellent cost effectiveness. Again I found the best offer for the Player on Amazon – good price, Prime delivery, stock – they have everything one could ask for and of course you can rely on their accomodating support.